Keep your friends close but your enemies within stabbing distance.One important lesson I’ve learned in the assassination business is that to be the best you have to roll with the punches. Now that I’m queen of Ashland’s underworld—by default, not by choice—a lot more punches are being thrown my way. But I suppose that’s the price of victory for taking down some of the underworld’s top dogs. Good thing I have my Ice and Stone magic to help me survive my volatile new position. Just when I think things are finally settling down, someone tries to murder me during a hush-hush underworld meeting. But the real surprise is how strangely familiar my shadowy assailant seems to be. Gin Blanco is reluctantly settling in to her new role as head of the Ashland underworld. When she goes to mediate her first dispute, she's met with a less than welcoming attitude, whiny mob bosses, and oh yeah, A BOMB. She's starting things off with a bang in all the wrong ways. Her investigation into the bomber brings back memories of a case that her late mentor, Fletcher Lane, worked on nearly twenty years ago. It reminds me that despite its huge personality, Ashland is a small town and everyone there is connected somehow. I always like seeing Fletcher again - I felt like he left the series too soon. In this instance, he also leads Gin to her current target and later provides a link to her next potential enemy. 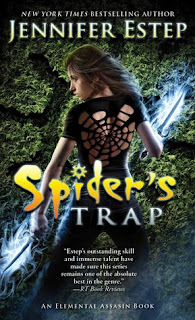 But in some ways I feel like that's all that Spider's Trap does - serve as a transition from M.M. Monroe to the next Big Bad. It doesn't contribute much to the overall series plot. Don't get me wrong, it's a solid story by itself, but it's also a very typical Gin story. The action scenes are exciting, as they always are in this series. Gin's nemesis is a strong elemental who gives her a run for her money and does some frightening (but really cool) things with magic that I hadn't seen before. I liked that there was a lot of Owen in the story. In fact, he and Gin were doing so well that I was sure something bad was about to happen to him. But lots of Owen meant a little less Finn and Bria and I sort of missed them. I also wish that Silvio had more to do. I'm still waiting for him to get interesting, but I have high hopes for him. Gin also makes a new friend (sort of) and I'm curious about how that relationship might develop later in the series as well. Really the worst thing I have to say about Spider's Trap is that it just didn't blow me away like Black Widow did. But it did take an interesting turn at the very end and I'm really looking forward to finding out how that plays out in the next book.